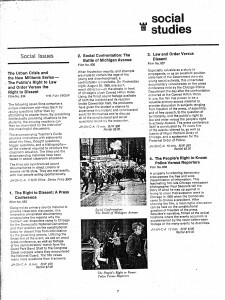 As mentioned in our previous post, CICERO MARCH was one of a seven part “module” or educational film series (“The Urban Crisis and the New Militants”) produced by the Chicago-based Film Group Inc. 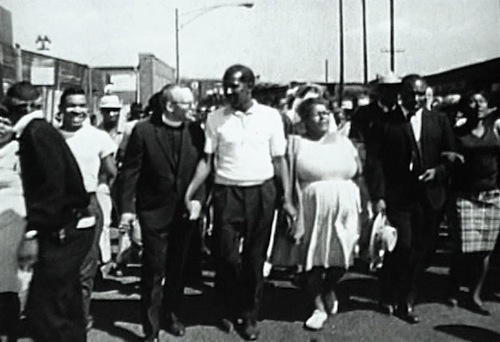 The majority of the series dealt with the 1968 Chicago Democratic National Convention, while two of the films (Cicero March and Black Moderates, Black Militants) are concerned with similar issues of civil rights and civil disobedience but were not filmed during the Democratic Convention. The Urban Crisis series gains further meaning when placed in this educational context, or rather, when you consider the targeted audience of the films – junior high, high school and college aged students. Being a kid of the ’80s and ’90s, it’s hard for me to imagine sitting in my social studies classes and being presented with direct cinema or cinema verité style educational films. In a downstate public school (don’t get me wrong, I’m proud of my public school roots! ), our classroom audio-visual selections were often limited to straightforward talking head documentaries produced alongside textbooks, or if we were lucky, a program distributed by PBS (I even remember watching Newsies in my high school U.S History class?!). For me, CICERO MARCH and the Urban Crisis series gain power when I consider their place within the classroom. These films presented tough, raw and REAL content to students, and let them figure it out, or at least consider it on their own terms. Giving teenagers this interpretive power would have provided such a valuable space for them to explore various issues surrounding racism, citizens’ rights, social protest, police brutality, the media industry and politics at large, to name a few. It’s hard to say how many schools and libraries purchased or rented the series or individual films when they were released in the late ’60s. According to the Film Group’s surviving member, Bill Cottle, the series unfortunately didn’t have many sales. Also frustrating the search is the fact that the films’ distributor, Henk Newenhouse Inc, is now defunct, with their main operating years being between the years 1967 and 1969. The Chicago Public Library circulating film collection (now housed at CFA) contained and rented the whole series, while a quick WorldCat search shows that York University Libraries in Toronto is the only other institution who currently has a print of CICERO MARCH. Who knows how many prints from the series have been de-accessioned over the years, or even properly cataloged and entered into a union catalog like Worldcat. I pass this investigation along to whomever is inclined…possibly an empowered student! Below are promotional materials from Henk Newenhouse Inc. These would have been provided to schools and libraries to entice them to purchase or rent the film and/or series. Click on the images to view them in more detail. HUGE shout out to Andy Uhrich for the scans! You can stream the entire Urban Crisis series on our site here, or over on our Youtube channel. Each year the National Film Preservation Foundation board names 25 films that are culturally, historically or aesthetically significant to our national heritage. 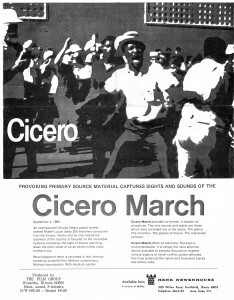 CHICAGO FILM ARCHIVES is honored and pleased that CICERO MARCH has been chosen to join the list of films that make up the National Film Registry. CICERO MARCH is visceral and relentless in its portrayal of barely contained racial violence during a civil rights march in a middle-class suburb of Chicago. Filmed during the time that Dr. Martin Luther King, Jr. came to organize for fair housing in Chicago, it undeniably reflects elements of our community psyche in 1966 — racism, gathering black push back, and a building sense of necessity (and obligation) by authorities to protect non-violent black civil rights marchers in the then hostile and mostly white streets of Cicero, Illinois. 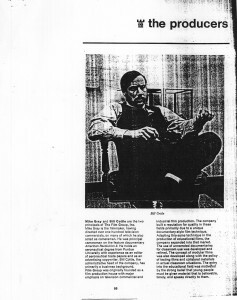 It is well documented that Chicago city officials, including Mayor Richard J. Daley, negotiated a Fair Housing agreement with Dr. King in exchange for the cancellation of this march. 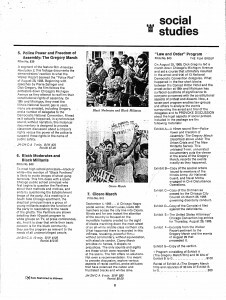 Nevertheless, Robert Lucas and other members of the Congress of Racial Equality (CORE) felt that the march was strategically necessary and proceeded with it anyway. 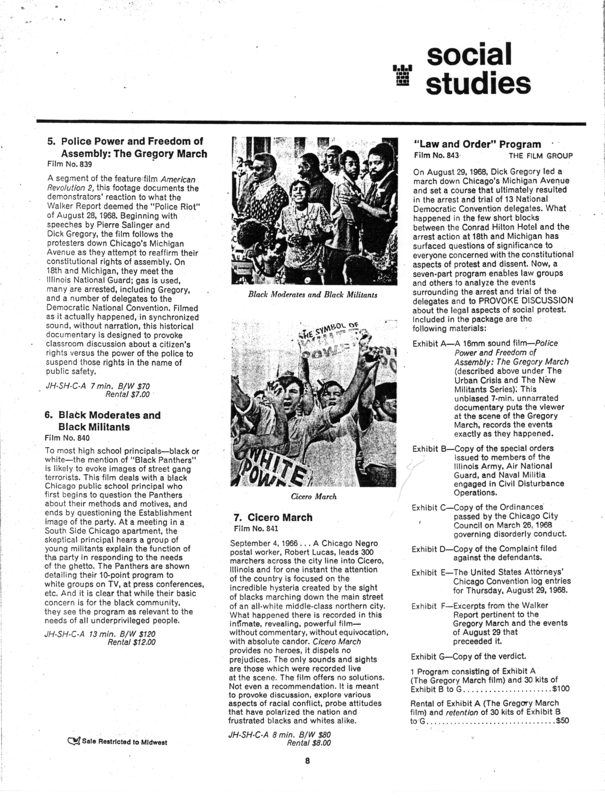 It is also important to note that if the Chicago-based Film Group had not made the decision to document this march, very few traces of this event would remain today. 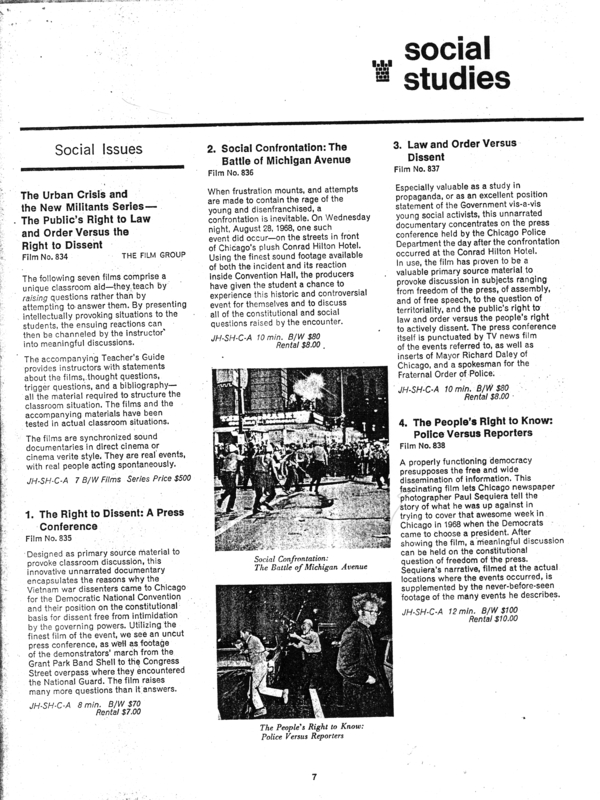 This film is part of a seven part module or educational film series (“The Urban Crisis and the New Militants”) produced by the Film Group that, “teach by raising questions rather than by attempting to answer them.” The modules tell their story through editing rather than voice-over narration and show “real events, with real people acting spontaneously,” as the Group explained to an educational film distributor. Discovered in CFA’s Chicago Public Library Collection, CICERO MARCH was first screened in 2005 at CFA’s second film screening ever, CHICAGO IS…”. 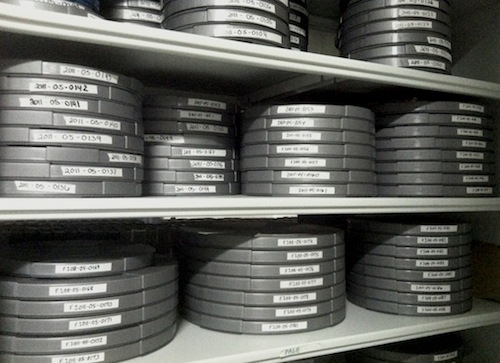 In 2006, CFA sought out and received funding from the National Film Preservation Foundation to photo-chemically preserve this powerful piece of cinema vérité. This 16mm restoration print now resides in CFA’s Film Group Collection. This year CFA submitted CICERO MARCH for consideration for the Registry. It is a fitting time for the film’s acknowledgment. The confluence of historical and social forces that brought about this incident and its documentation was partially embodied in two men whom we have recently lost. Robert Lucas, who chaired the Chicago branch of the Congress of Racial Equality (CORE), led the volatile march in Martin Luther King, Jr.’s absence. Lucas passed away in March of last year. Filmmaker and author Mike Gray, who documented this march in Cicero and who also leaves behind a legacy of activism, died this past April (more on Mike Gray and the Film Group here). Mike Shea (1925-1995), a Chicago LIFE Magazine photojournalist who transitioned into cinematography with the Film Group, shot CICERO MARCH. Shea went on to become a cinematographer on feature-length films in LA. He died in a helicopter crash while working on his last film. Heartfelt congratulations go to William Cottle who is the surviving principle member of the Film Group. He and his wife Judy live in Winnetka, IL. In the video below, Robert Lucas recalls the 1966 march in Cicero after a CFA Screening (“To Bear Witness: The Question of Violence”) held at the ICE Theater in 2006. CICERO MARCH is available for viewing both on CFA’s website and Youtube channel.